Buy this by the case, put some in the basement to forget about for a couple of years and drink the rest now. An Amazing Rioja that strikes a great balance between old world elegance and modern power, one of the best values I have tasted in years. 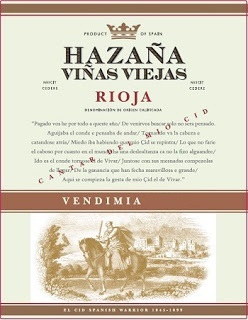 The 2014 Hazana Vinas Viejas is simply one of the greatest values in Rioja that money can buy. A blend of 85% Tempranillo and 15% Graciano, this collaboration between importer Eric Solomon and the owner and winemaker has produced an absolutely amazing Rioja from 45- to 70-year-old unirrigated, head-pruned vines. Loads of lead pencil shavings, black and red currants, licorice and tobacco leaf all jump from the glass of this dense, ruby/purple wine. Soft tannins, medium to full body and fabulous intensity, make for a sensational Rioja to drink over the next 5-7 years. If the good news. The good news, in addition to a drop-dead price point is that there are 20,000 cases imported to the U.S.